Salmon Bake on Sept. 5th at 6:00 p.m. The North Lake Salmon Bake will take place on Labor Day, September 5, 2011 at 6 p.m. at Beer Bottle Beach. Bring side dish, salad, or dessert and your own drink. Plates and silverware provided. 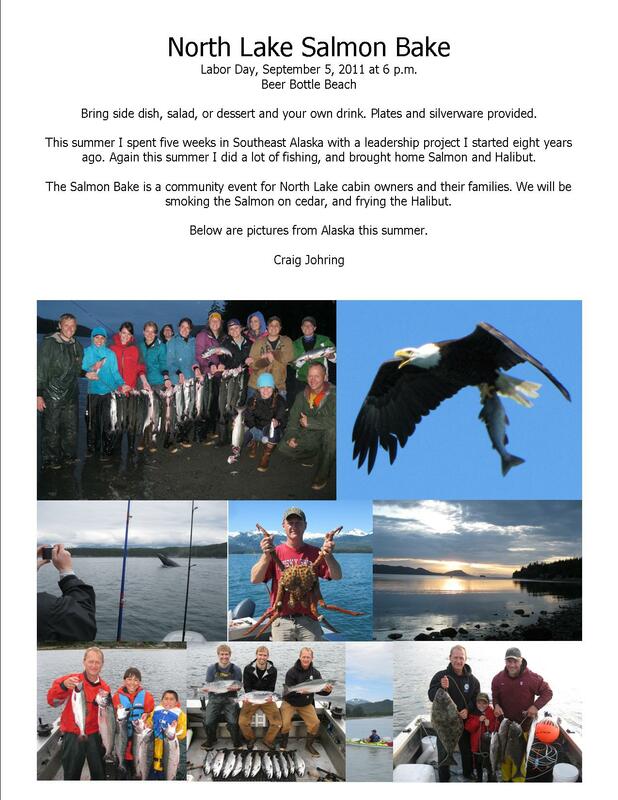 The Salmon Bake is a community event for North Lake cabin owners and their families put on by Craig Johring. 3 Responses to Salmon Bake on Sept. 5th at 6:00 p.m.
Craing – Thank you! The salmon was the best ever…and it’s always great. Perfect weather…perfect get together. Thank you to all helped or took part with the Salmon Bake. This was our 5th Salmon Bake and the biggest yet. This year we dropped catfish and carp from the menu and served only Halibut and Salmon. The Salmon were caught in a bay 25 miles north of Juneau, Alaska. The Halibut came from 325 feet of water 15 miles north of Auke Bay Harbor near Juneau, Alaska. The Salmon was cooked on untreated cedar boards. The ingredients in the topping were: parmesan cheese, sour cream. green onion, green pepper, cilantro, salt, pepper, cayenne pepper, dill, thyme, basal, and lime juice. The recipe for the Beer Battered Halibut came from Alaska and was modified by Peggy Clements. The next Salmon Bake will take place at Beer Bottle Beach on Labor Day, September 3, 2012 at 6:00 p.m.
Another wonderful night of sharing! Thank you Craig for all the hard work and providing us with a real treat! Absolutely delicious! All the side dishes and deserts were awesome too! Great to see everyone.